Okay...the title says it all. I got Super-Glue in my eye. Yup! Of course it was two hours before my dinner guest was going to arrive. I was just about to finish dessert and toss a salad and I saw this little teapot my daughter had broken and left on the counter for me to fix. In the spirit of having a spotless house when I have company (because that is the only time I even try), I grabbed the Super-Glue to fix this little pot so I could get it put away. It was a little crusted on the top, so I picked off the dry piece and when I did, I released the pressure from the inside and the stuff shot in my eye. It instantly bonded to my eyeball and dried. It was the weirdest feeling. I then completely melted down into a panic attack. I can usually exhale my way through pain and things, but this freaked me out. Maybe it was because I had just listened to the details of my Aunt's cancer surgery and reconstruction of her entire throat and neck...maybe I've just seen too many weird things on TV or the fact that I must be literally knocked out of commission for at least 48 hours before I even consider seeing a doctor. But I literally could not breathe thinking about doctors removing this piece of glue from my eye with tweezers or thinking about the last time I got super glue on my skin and how painful it was to remove and the fact that this was on my eye!.. or needles...what is it with doctors and needles?! With one quick google search, my husband had a solution of baking soda and water for me to rinse with and told me to calm down because it would take several hours for this piece of glue to slowly make it's way out of my eye. So that's what we did. It hurt so much. The baking soda solution stung so much, but seemed to offer momentary comfort, so I kept using it. About 5 hours later I could tell it was starting to loosen and I was able to fall asleep. It was gone by morning, my eye was just a little crusty, like I had a cold. I should also mention we still had our guest and an amazing dinner complete with 2 veggies, salad and cobbler. I will probably follow up with my eye doctor next week before I start wearing my contacts again. Have you ever done anything ridiculous like this? I was most surprised by the panic attack I had. I've only had one other panic attack and that was when I went into be induced with my son. I really didn't want to be induced, but because of a bunch of circumstances I was pressured into doing so. And I panicked when they went to put in my IV...like I couldn't breathe and was crying uncontrollably. I know the word panic attack is over used in our Xnax-loving society...but these were times when I was literally out of control of my body and mind. Pretty scary. I also couldn't help but thinking I would be a total failure if I ever attempted to have a home-birth (which is my plan if Number #5 ever graces our presence). Sorry to ramble. Couldn't help but share this freakish occurrence It will probably never happen to you, but if it does...STAY CALM and flush your eye! Nice post. 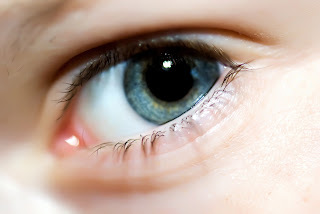 An eye is the main organ of our human body which help to see all over our surrounding. To know about the Best eye doctor in Westchester visit Hudson Ophthalmology. If my other half had said what your's had said I would of smacked him in the face!